Apotropaic magic (from Greek αποτρέπειν "to ward off" from από- "away" and τρέπειν "to turn") is a type of magic intended to turn away harm or evil influences, as in deflecting misfortune or averting the evil eye. Apotropaic observances may also be practiced out of vague superstition or out of tradition, as in good luck charms (perhaps some token on a charm bracelet), amulets, or gestures such as crossed fingers or knocking on wood. The Greeks made offerings to the "averting gods" (ἀποτρόπαιοι θεοί, apotropaioi theoi), chthonic deities and heroes who grant safety and deflect evil. An apotropaic wand shows a procession of protective deities. It was used in birth rituals, perhaps to draw a magic circle around the mother and child. Apotropaic magical rituals were practiced throughout the ancient Near East and Egypt. Fearsome deities were invoked via ritual in order to protect individuals by warding away evil spirits. In ancient Egypt, these household rituals (performed in the home, not in state-run temples) were embodied by the deity who personified magic itself, Heka. The two gods most frequently invoked in these rituals were the hippopotamus-formed fertility goddess, Taweret, and the lion-demon, Bes (who developed from the early apotropaic dwarf demon-god, Aha, literally "fighter"). Objects were often used in these rituals in order to facilitate communication with the gods. 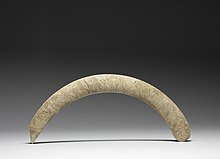 One of the most commonly found magical objects, the ivory apotropaic wand (birth tusk), gained widespread popularity in the Middle Kingdom (ca. 1550 – 1069 BCE). These wands were used to protect expectant mothers and children from malevolent forces, and were adorned with processions of apotropaic solar deities. Likewise, protective amulets bearing the likenesses of gods and goddesses like Taweret were commonly worn. Water came to be used frequently in ritual as well, wherein libation vessels in the shape of Taweret were used to pour healing water over an individual. In much later periods (when Egypt came under the Greek Ptolemies), stele featuring the god Horus were used in similar rituals; water would be poured over the stele and—after ritually acquiring healing powers—was collected in a basin for an afflicted person to drink. The Gorgon, flanked by lionesses and showing her belt clasp of serpents; the pediment of the 580 BCE temple of Artemis in Corfu. Archaeological Museum of Corfu. Among the ancient Greeks, the most widely used image intended to avert evil was that of the Gorgon, the head of which now may be called the Gorgoneion, which features wild eyes, fangs, and protruding tongue. The full figure of the Gorgon holds the apex of the oldest remaining Greek temple where she is flanked by two lionesses. The Gorgon head was mounted on the aegis and shield of Athena. Eyes were often painted to ward off the evil eye. An exaggerated apotropaic eye or a pair of eyes were painted on Greek drinking vessels called kylikes (eye-cups) from the 6th century BCE. [clarification needed] The exaggerated eyes may have been intended to prevent evil spirits from entering the mouth while drinking. Fishing boats in some parts of the Mediterranean region still have stylised eyes painted on the bows. The defunct Turkish budget airline, Fly Air, adopted the symbol nazar boncuğu (nazar bonjuk) on the vertical stabilizer (fin) of its aeroplanes. The apotropaic Yiddish expression, "kain ein horeh" ("no evil eye", קיין עין הרע, in modern Hebrew "בלי עין הרע"-"Bli ein ha'ra") is somewhat equivalent to the expression, "Knock on wood." People believed that the doorways and windows of buildings were particularly vulnerable to the entry or passage of evil. 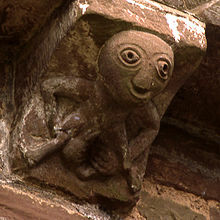 On churches and castles, gargoyles or other grotesque faces and figures such as sheela na gigs and hunky punks were carved to frighten away witches and other malign influences. Figures may also have been carved at fireplaces or chimneys; in some cases, simple geometric or letter carvings were used for these. When a wooden post was used to support a chimney opening, this was often an easier material for amateur carving. To discourage witchcraft, rowan wood may have been chosen for the post or mantel. Mirrors and other shiny objects were believed to deflect the evil eye. Traditional English "Plough Jags" (performers of a regional variant of the mummers play) sometimes decorated their costumes (particularly their hats) with shiny items, to the extent of borrowing silver plate for the purpose. "Witch balls" are shiny blown glass ornaments, like Christmas baubles, that were hung in windows. Items and symbols such as crosses, crucifixes, silver bullets, wild roses and garlic were believed to ward off or destroy vampires. A worn-out man's buckle shoe from the 18th century was found in the wainscoting of the Combination Room, St John's College, Cambridge. This was placed in the wall "as an apotropaic item intended to ward off evil and bad luck." The discovery was interesting, because this kind of magic is a silent tradition in England. After the repairs were done to the wall, the shoe was re-interred along with some current coins, a custom when dealing with finds like this. Replacing the shoe and concealing it respects the original desire of the owner. In Ancient Greece, phalloi were believed to have apotropaic qualities. Often stone reliefs would be placed above doorways, and three-dimensional versions were erected across the Greek world. Most notable of these were the urban monuments found on the island of Delos. Grotesque, satyr-like bearded faces, sometimes with the pointed cap of the workman, were carved over the doors of ovens and kilns, to protect the work from fire and mishap. A similar use of phallic representations to ward off the evil eye remains popular in modern Bhutan. It is associated with the 500-year-old Buddhist tradition of Drukpa Kunley. It is paralleled by other South Asian uses of the lingam symbol. In Roman art, apotropaic imagery was a common theme. Envy was thought to bring bad luck to the person envied. To avoid envy, Romans sought to incite laughter in their guests by using humorous images. Images such as large phalluses (see fascinus), deformities like hunchbacks, or Pygmies and other non-Roman subjects were common. Romans saw deformity as comical and believed that such images could be used to deflect the evil eye. In Europe, apotropaic figureheads carved onto the prow of sailing ships are considered to have been a replacement for the sacrifice of a thrall during the Age of Invasions by Saxon and Viking sailors, to avoid bad luck on the voyage. Dredging of the Thames under London Bridge led to the discovery of a large number of bent and broken knives, daggers, swords and coins, from the modern period and dating back to Celtic times. This custom seems to have been to avoid bad luck, particularly when setting off on a voyage. Similarly, the burial of an old boot or shoe by the lintel of the back door of a house seems to have had a similar intention. Apotropaic marks such as the initials of the Virgin Mary were scratched near the openings of buildings in England to ward off witches. It is difficult to differentiate between items supposed to avert evil and items intended to attract good fortune, but generally a talisman brings good luck whereas an amulet wards off or protects against and is therefore apotropaic. In Ireland, St Brigid's crosses, woven from rush, were kept indoors (in houses and animal houses) to keep away illness for the year. In some Native American cultures, a dreamcatcher made of yarn like a web is placed above a bed or sleeping area to protect sleeping children from nightmares. Ashkenazi Jews' apotropaic names were often given not at birth but during serious illness. An example is Nekras (Некрас, "not handsome" in Russian), with the hope the child would be handsome, and Yiddish names Alter and Alte ("old"). Among Serbian names are many apotropaic names (zaštitna imena, "protective names"), such as Vuk (and its many derivatives) and Staniša. Some traditional Taiwanese names referenced domestic animals such as "buffalo" (水牛) and "dog" (狗, 犬), or humble elements of the landscape like "soil" and "water" (土, 水). 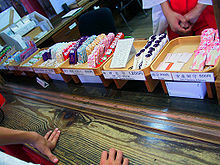 They conveyed contentment with a peaceful and low-profile life. ^ The children's TV series Magpie preserved these rhymes as its theme song into the 1970s. ^ Gilleland, Michael, ed. (26 June 2008). "Averters of Evil". Translated by Jones, W.H.S. Archived from the original on 2013-06-15. Retrieved 3 July 2010. Hippocrates, Regimen 4.89: So with this knowledge about the heavenly bodies, precautions must be taken, with change of regimen and prayers to the gods; in the case of good signs, to the Sun, to Heavenly Zeus, to Zeus, Protector of Home, to Athena, Protectress of Home, to Hermes and to Apollo; in the case of adverse signs, to the Averters of evil [apotropaioi], to Earth and to the Heroes, that all dangers may be averted. ^ Robert Ritner (1988). The Mechanics of Ancient Egyptian Magical Practice. Chicago: The Oriental Institute of Chicago, 14-28. ^ James F. Romano (1978), The Origin of Aha (also called Bes). New York: College Art Association, 1978. ^ Hartwig Atlenmüller (1965). Die Apotopaia und Die Götter Mittelägyptens. Munich: Ludwig-Maximilians University. ^ "apotropaic eye (art)". Encyclopædia Britannica. Retrieved 2014-03-22. ^ Tschen-Emmons, J.B. (2015). Artifacts from Medieval Europe. Daily Life through Artifacts. ABC-CLIO. p. 72. ISBN 978-1-61069-622-7. Retrieved May 11, 2018. ^ Ayres, James (2003). Domestic interiors: the British tradition, 1500–1850. Yale University Press. p. 24. ISBN 0-300-08445-5. ^ "Artifact". Archaeology Magazine. November/December 2016. Page 68. ^ Harrison, pp 187ff "The Ker as Gorgon". ^ "Bhutan's phalluses ward off evil". BBC News. 2005-03-25. Archived from the original on 13 December 2009. Retrieved 2010-01-01. ^ Kennedy, Maev (31 October 2016). "Witches' marks: public asked to seek ancient scratchings in buildings". The Guardian. Retrieved 31 October 2016. ^ Alexander Beider (2009). Handbook of Ashkenazic Given Names and Their Variants. Avotaynu. ISBN 978-1-886223-43-1. ^ Alexander Beider (29 October 2015). Origins of Yiddish Dialects. OUP Oxford. pp. 183–. ISBN 978-0-19-105981-0. Roud, Steve (2004). A Pocket Guide to Superstitions of the British Isles. London: Penguin. ISBN 0-14-051549-6. Wikimedia Commons has media related to Apotropaic magic. Apotropaic protection at Kilbirnie Place castle keep North Ayrshire, Scotland.